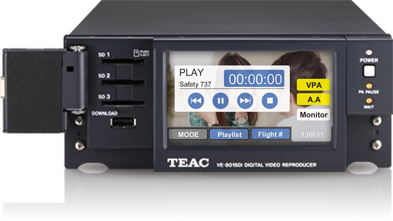 The VE-801SDi can replace conventional IFE reproducers with minimal engineering or aircraft impact, because it uses the same form factor as almost all current IFE tape video systems. The VE-801SDi plays back audio directly from an SD memory card. With a front touch panel LCD designed to be instinctive and easy to use. Reduce Attendant training time.